In the 20th century, Los Angeles expanded its transportation systems with the belief that the car was king. The city tore out miles of streetcar track and replaced them with massive roads and highway systems to encourage driving. Now, Angelenos spend an average of 59 hours sitting in traffic every year. People are beginning to turn to alternate forms of transportation, in particular cycling. But it seems that many are unaware of both the benefits that cycling brings and the challenges that bikers face. Most people are aware of the positive health impact that cycling provides, such as improved cardiovascular systems and lowered rates of obesity; however, there are many other benefits that are commonly overlooked. In a smoggy city such as Los Angeles, bicyclists do not pollute the air with exhaust. Cycling through a city also connects people with a community in ways that cars travelling at higher speeds cannot. 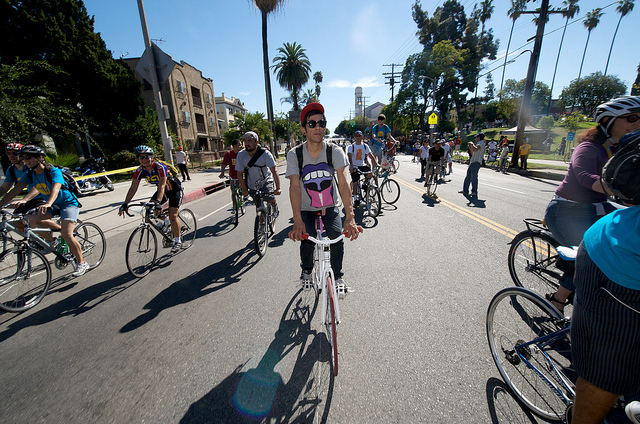 When Los Angeles hosted the June 2013 CicLAvia and closed down miles of road to vehicle transportation, the UCLA Luskin School of Public Affairs released a report saying businesses along the CicLAvia route experienced a 10 percent increase in sales that day. Bike parking also takes up very little room, freeing up car lots for other uses, such as shopping areas or public spaces. Michael Kodama, Executive Director at Eco-Rapid Transit, President at Michael R. Kodama Planning Consultants and professor at the USC Price School of Public Policy, believes that one of the biggest obstacles cyclists face is a general misunderstanding of the needs of bicyclists. "As a cyclist, you're simply not represented. How many people in the government are avid bicyclsits?" he asks. Legislators need to understand that bikers need a set of laws that protect them from cars and facilitate cycling on the road. For example, the idea that bikers need to stop at all stop signs in a residential area is not very efficient since cyclists spend five times the energy to maintain speed with stops. In 1992, Idaho passed a law that allows cyclists to pass through stop signs at a “reasonable speed.” After 20 years, a UC Berkeley study has shown that there has been no significant increase in bicycle fatalities or injuries as a result of this law. In fact, this law also increases the number of bikes on the road since bikers do not have to spend as much energy getting to their destinations. Even though cities like New York and San Francisco have constructed miles of bike lanes, cyclists can face difficulties navigating them since they are often blocked by obstacles such as cars or construction work. If cities wish to facilitate cycling, they need to also introduce ordinances that protect cyclists from these dangers. In fact, some of the biggest deterrents to biking are safety concerns. Most people feel uncomfortable, myself included, riding in narrow bike lanes that offer no protection from cars. While there needs to be a move towards protecting cyclists, bicyclists themselves are also at fault for failing to understand the most basic rules of the road. Trousdale Avenue in the University of Southern California handles thousands of students and commuters every day; however, it is one of the most dangerous streets in Los Angeles to bike on. Often, you will see bikers and pedestrians travelling against the flow of traffic, oblivious to the dangerous situation they are creating for everyone else around them. It is hard to fathom why this is such a widespread problem since the lanes are quite clearly marked with bright white and yellow paint along with directional arrows that point towards the flow of traffic. All the infrastructure for an efficient cycling system is there: people just seem too ignorant use it properly. It really takes little effort for a cyclist to get into the right lane or for a pedestrian to walk outside of the bike lane. Imagine what someone from the surrounding neighborhoods would think if he saw students from an elite university struggling to use something as simple as a bike lane. While replacing some driving lanes with bike lanes and cycle tracks (bike lanes separated from the street with a physical barrier) seems like a recipe for severe traffic congestion, a simple look at each mode of transportation disproves this idea. Cars are actually some of the most inefficient forms of transportation in an urban environment like Los Angeles: they take up a lot of road and parking space and only hold a few people. Now imagine the number of bikes you can put on the road for the space of one car. If for every car we can put out, say, six bicycles, we can quickly reduce the number of cars on a road as well as the time we waste sitting in traffic. Kodama believes that there “needs to be a culture shift in how we look at bicycle transportation.” While Los Angeles has implemented miles of bike lanes and cycle tracks, employers too can assist workers that bike to work, such as by introducing facilities showers for employees who ride their bike to work so they can wash themselves and put a suit on after. For high rise buildings, Kodama also proposed creating a valet bike parking system so employees would not have to leave them out on the street. Despite the benefits that cycling provides not only for people, but for a city’s transportation system, there will still be a need for cars. We will still need to travel distances that would be arduous on a bike and get to certain destinations quickly. However, there are many instances where we could turn to biking as a healthier, more efficient and more social form of transportation. In turn, these would help ease urban traffic congestion as well as connect the community. For the future, we can expect to see more cities adopting biking friendly policies. Los Angeles is already in the process of renovating the Figueroa Corridor by adding cycle tracks and bike lanes with the MyFigueroa project. While our cycling infrastructure may never reach the level of Copenhagen's (where more people ride their bike to work in one city than in the entire United States), people will begin turning to cycling due to its numerous benefits for individuals, the environment and the city they live in.